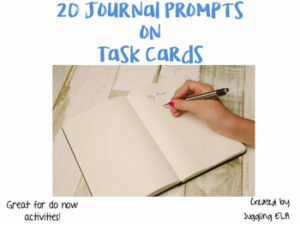 There are 20 journal prompts included here.. Each prompt is on it’s own task card. The task cards are aligned with the common core state standards for grades 5-10 and the standards are listed at the end of the product for your convenience. This file contains a PDF copy of my 20 Journal Prompts On Task Cards. I would print them out on stock card paper (colored or white) and laminate them so you can use them year after year.